My Home Studio looks 'Yarn Bombed'. 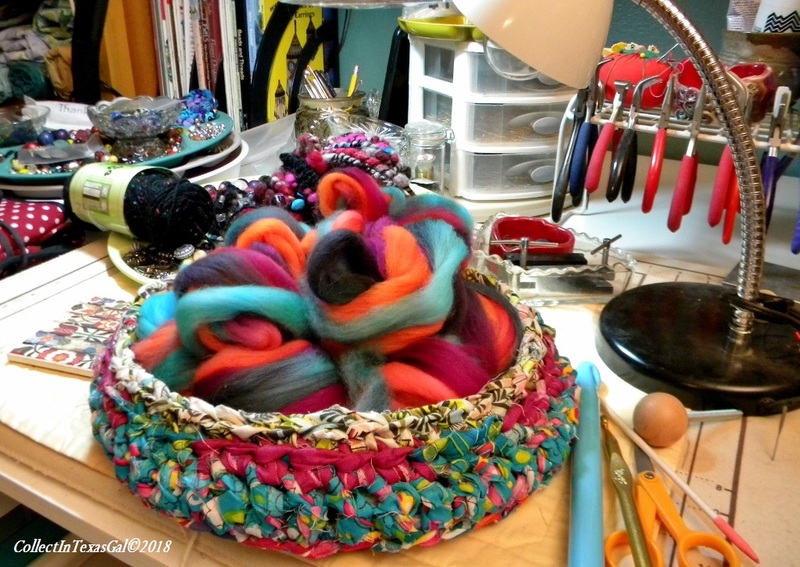 Practically every yarn apparatus, bag, bin, basket and bead container I own is open for auditioning several projects in the making. 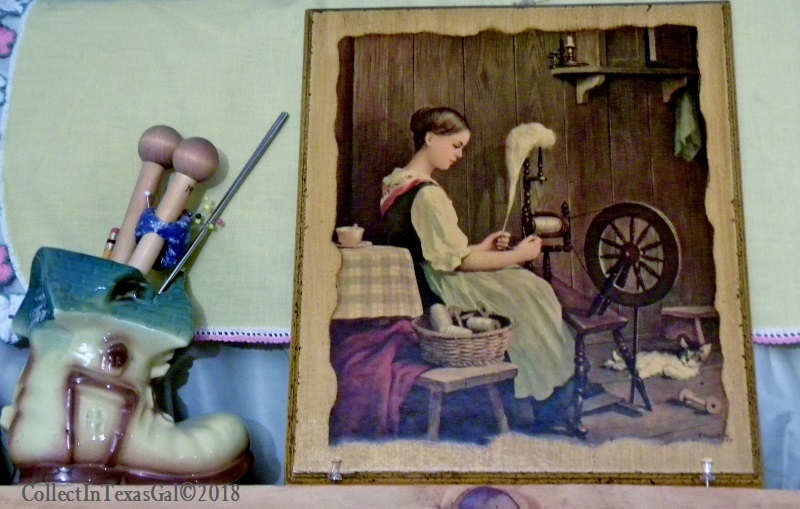 Of course it's a major multi-tasking medium operation with weaving frames warped, jewelry table covered, and spinning wheel humming. And in my defense...I'm not in an 'OverDoSue' mode...yet! Do I have a planed project in mind? Sorta! 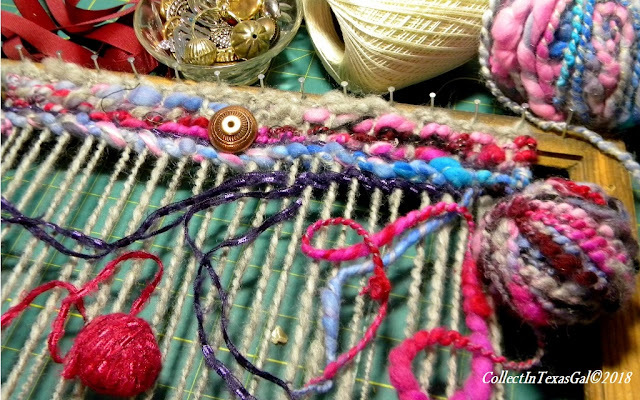 In the 'Audition' process for using the newly spun 'Art Yarns' I decided to start a somewhat 'FreeForm' weaving. First was choosing a warp yarn. 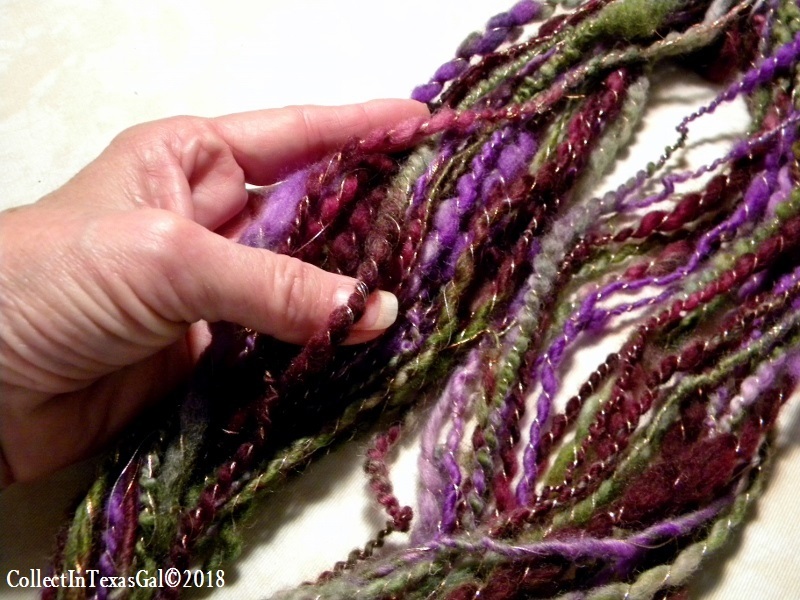 The gray wool skein from my first two spinning lessons worked out great for warping a 12x16 or so handmade frame. 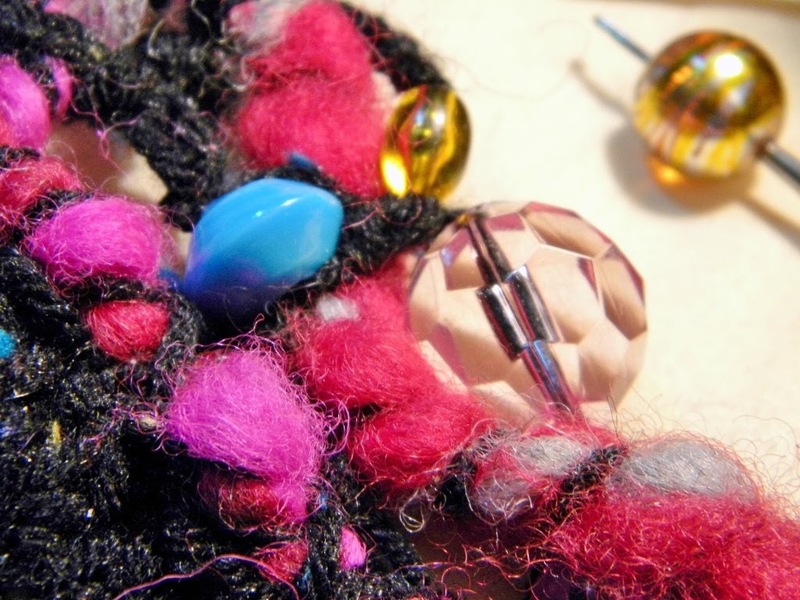 Next from the hours of practice spinning, plying and setting are 'Art Yarn' balls. After a few rows of setting the warp and weave the fun of mixing weaving techniques of basket weave, twinning, wrapping and whatever else looks kind of funky, a few beads and buttons were auditioned. From the baskets and bins of novelty ribbon yarns came a few shiny, glitzy additions. 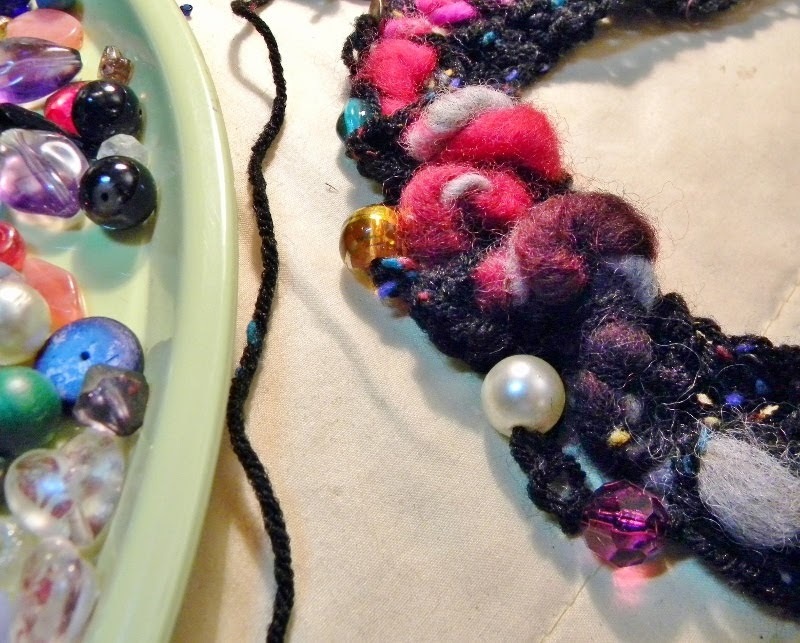 It's early in the process, but I'm thinking a 'Boho Bag' may be in the making. At this stage I should dig through the upholstery fabric bin. 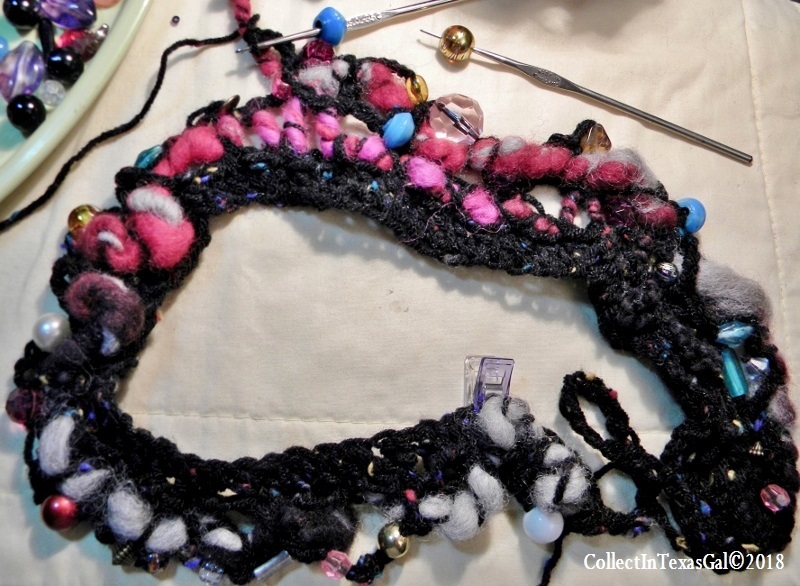 Oooooh...something with a lot of texture, and maybe a piece of silky stuff for lining. Auditioning over? Probably not, but it's a start! Are you wondering what and when the finish will be? ser-en-dip-i-ty...the occurrence and development of events by chance in a happy or beneficial way. 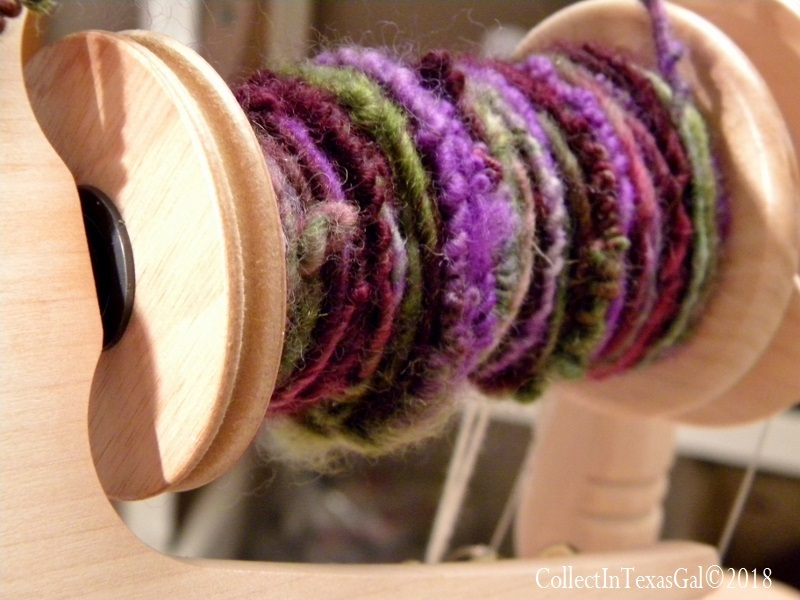 By CHANCE I met a group of spinners at an EVENT at The Chicken Farm Art Center. Am I HAPPY? Absolutely...becoming a part of The Serendipity Spinners has been BENEFICIAL and has enriched my life with the Art of Spinning and Friends who share in every aspect of spinning...from sheep to shop! 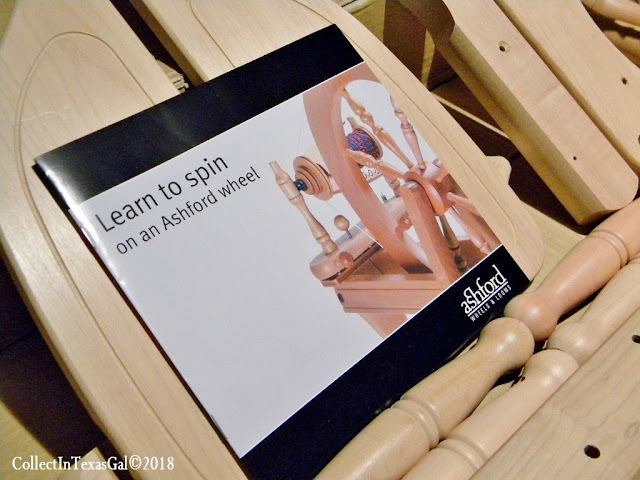 Yes, I did spin. My Traveler wheel lived up to its 'made to travel' image. 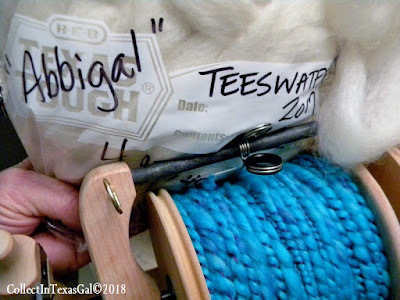 Together we plied a skein of turquoise spun yarn on the Jumbo Flyer. What's a Jumbo Flyer? Glad you asked since it gives me an opportunity to better understand it to explain it to others. First it is larger than the standard ones that came with the wheel, and has a much larger Orifice...black hole at the end. 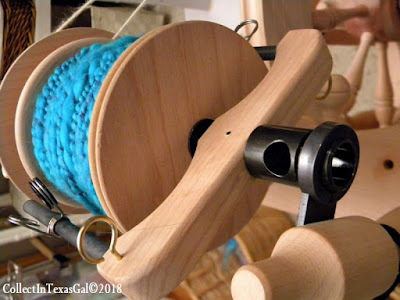 Jumbo allows for fatter size spun yarn to feed through the orifice and hook guides onto the larger capacity spool. 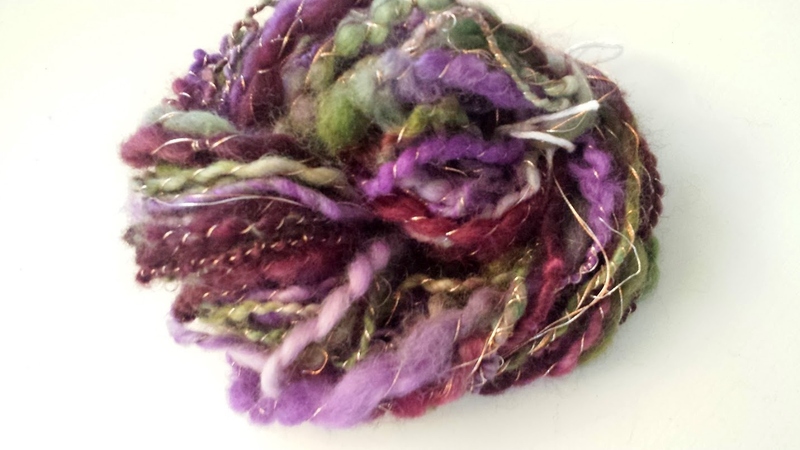 Since I spin mostly thick and thin art yarn, Jumbo is a must. It can be switched out with the 'Standard Flyer' in just a few minutes by removing the orifice holder...black thingy that screws onto wood thingy. 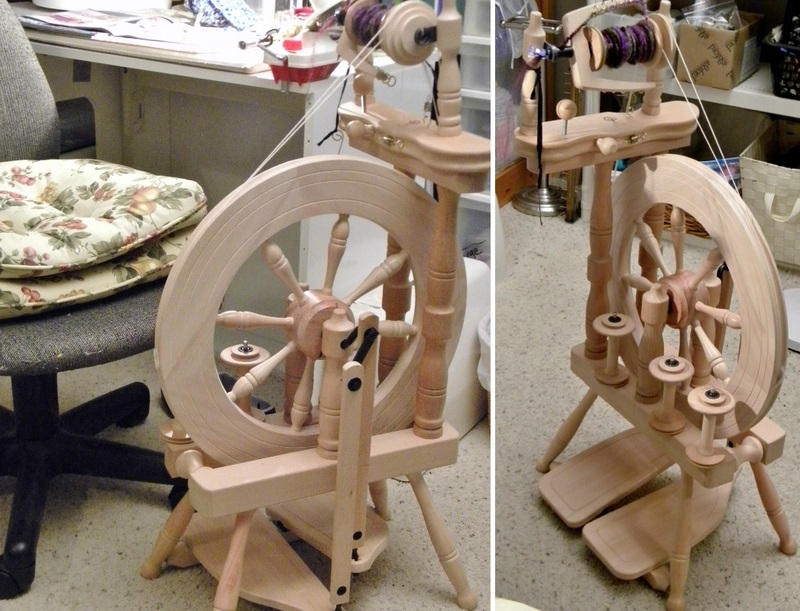 I love spinning on Jumbo, so naturally I NEED a couple more spools...they have been ordered and are on the way! 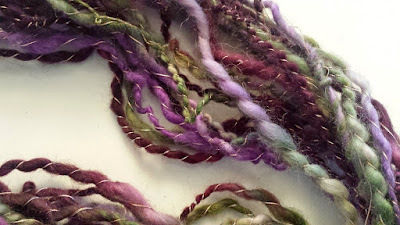 Although they are not priceless...this whole spinning thing still is! 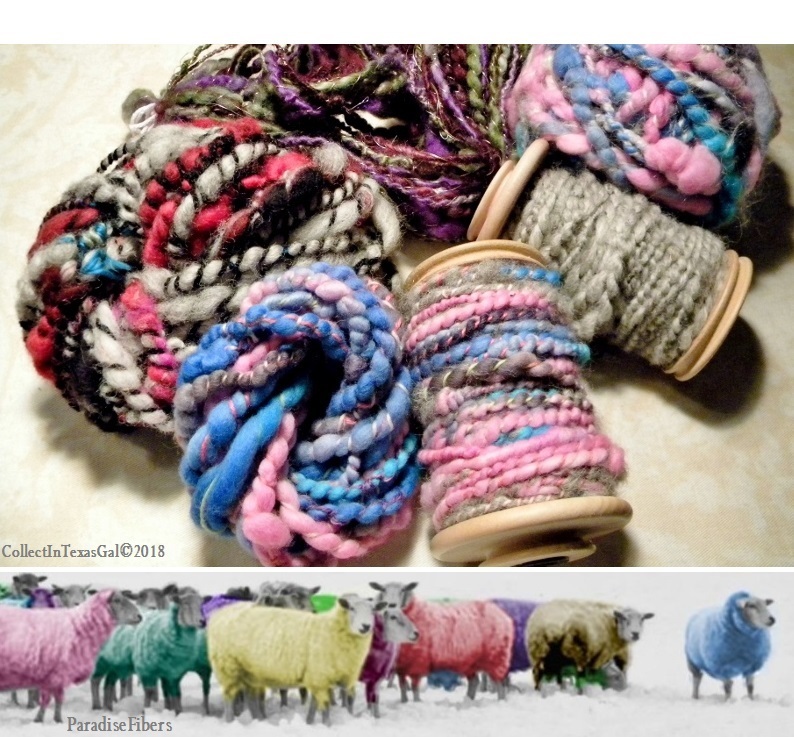 Now about The Serendipity Spinners and their sheared sheep of which 'Abbigal' is one. Here is a group of ladies well into their mid 50's and then some...like me...who raise a flock of sheep. They are Shepherdess' in every sense of the word, and take great pride and care of every one of their sheep. I do not plan on becoming a Shepherdess. Remember, I have already said, "I am not doing 'Sheep to Shop'. I go straight to the 'Shop' for my 3 bags full. Okay it may be more like 5 or 6...so far! Anyway, I shopped at our spinning meeting and got a bag of Abbigal's roving. How could I not with a name like Abbi-gal. She is a Teeswater breed. Did I know what that was? 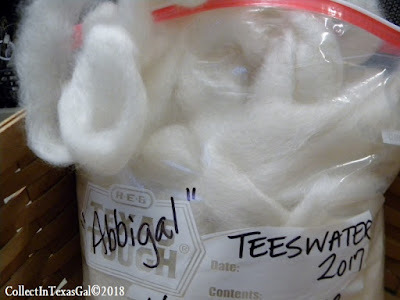 No, I picked it for how it felt and it was white...then I googled Teeswater...here. I think Abbigal probably comes from Royalty! 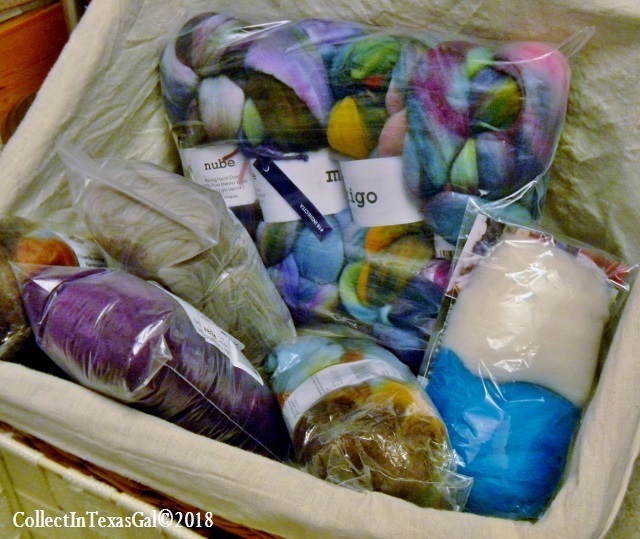 So here I am with a collection of 'Scrappy Spun' Art Yarn. I have emphatically said, "I'm not knitting or crocheting socks, sweaters or any other items that require two of a kind". 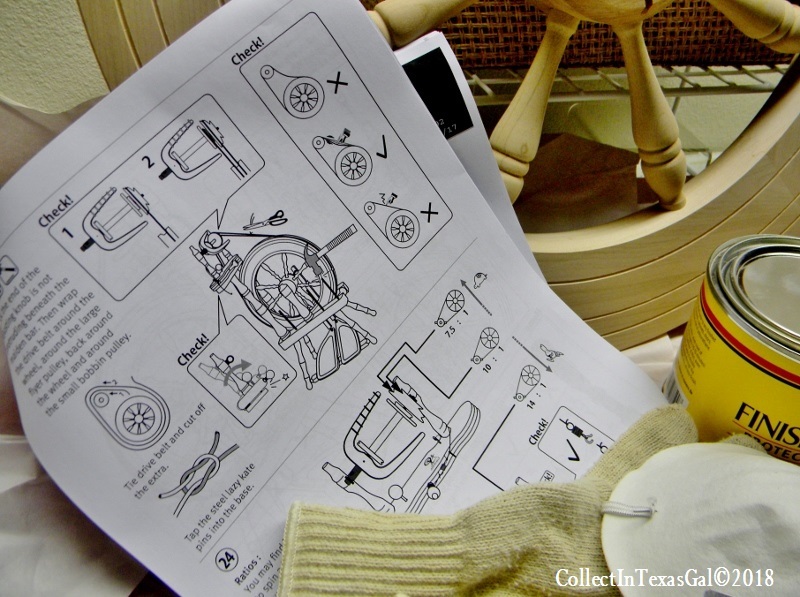 I have also made much ado about being a 'Practical Person' with a utilitarian thread running through me. That translates to useful things...beautiful useful things...I don't make ugly! What do I do with scrappy art yarn? 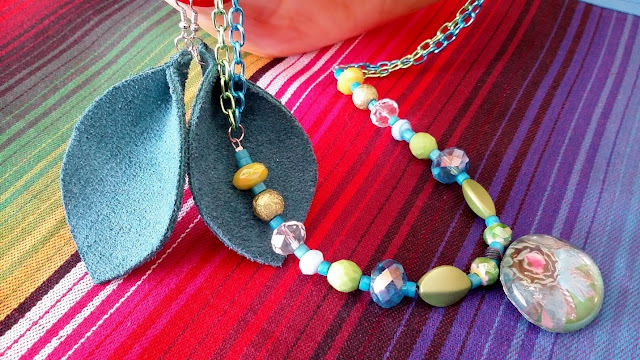 A 'One of a Kind Necklace' is USEFUL...right? 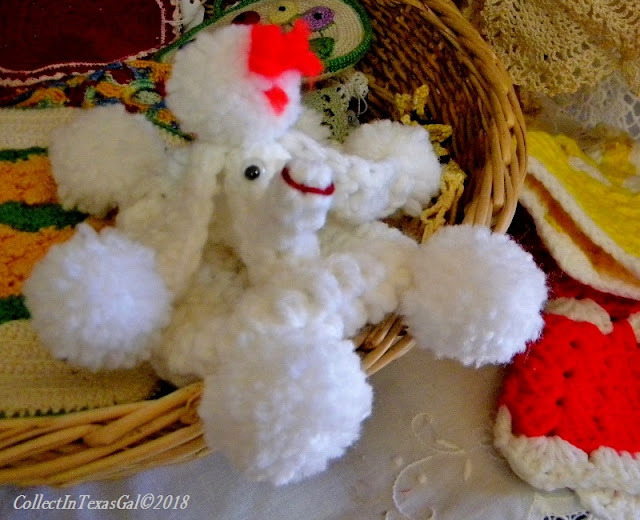 When Mary had a little lamb...she may have taken it to school, but she did not take that fleece as white as snow out in the freezing, rainy, muddy weather. Instead she stayed home, sheared the snow white fleece...which was so clean from not being out in the freezing, rainy, muddy weather she skipped the cleaning step. 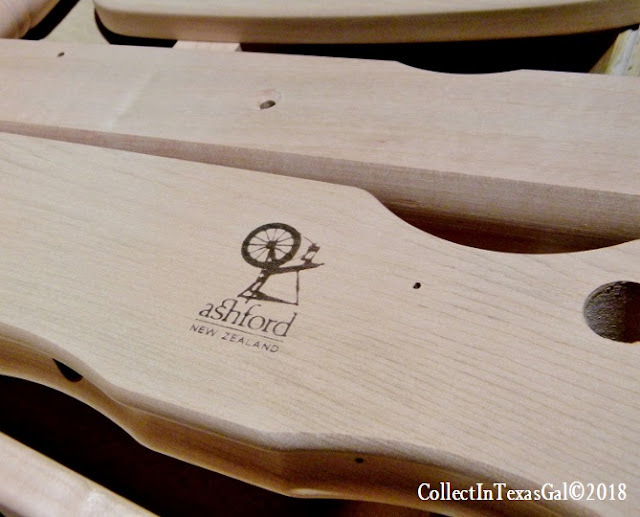 Then she breezed through all the steps it took to get it ready for packaging and shipping. What a smart girl Mary was, and today because it is freezing, rainy and muddy, I am not taking my 'Little Lamb Lovelies' to school work either. 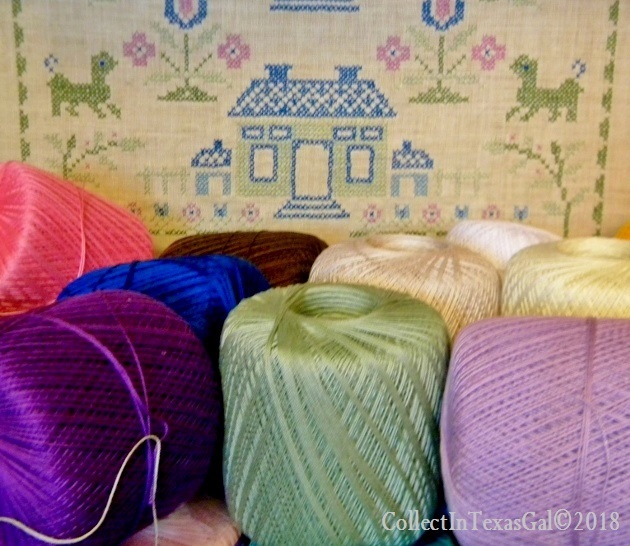 Nope, I'm staying home and playing with recently received packages of wool from Mary Paradise Fibers. 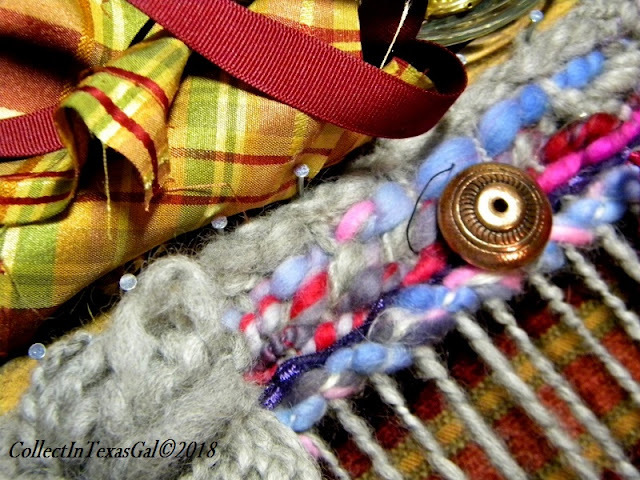 I'm finding...that just like in quilting/sewing, spinning out of the scrap basket is one of my favorite things to do. 'Scrappy Spinning'!!! Changes are good...right! I have found that frequent changes in my shop give shoppers and browsers an opportunity to see something new every time they visit. When they say, "Oh, is that new? I haven't seen that before", I know my frequent switch-a-rooing is working. In the case of the Butterfly Wheel quilt, it has been in and out of the shop since I opened in February of last year. Can you believe it has been a year? My, how butterfly time flies! 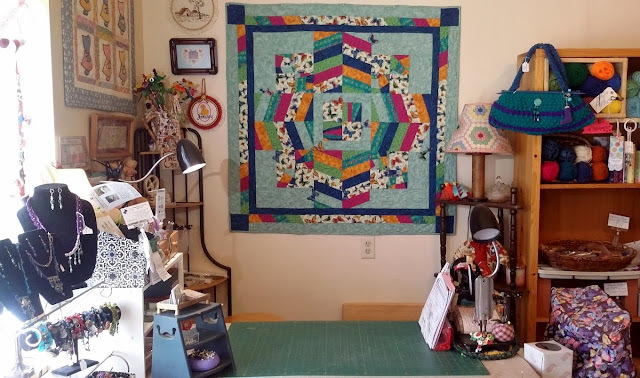 I love this quilt and can't bring myself to hang a price tag on it....yet!!! Valentines has come and gone...barely. It was three days ago, and I couldn't wait to move the center Valentine display. 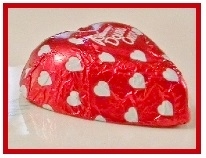 Valentines was on a Wednesday...which is not a day of the week I am usually open nor a busy day at the Chicken Farm. 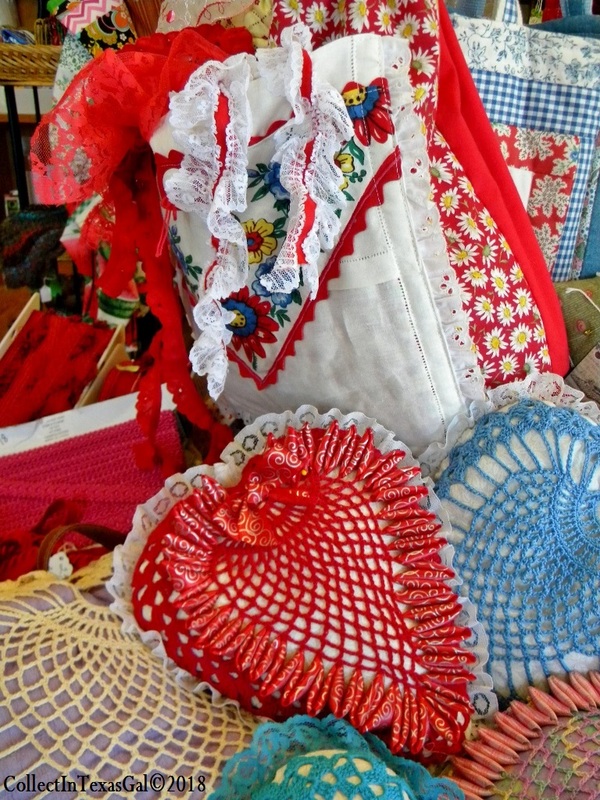 By the end of the day all the Valentine Venue pieces were incorporated into the Vintage Wall displays. I THINK I will leave this Vintage Wall alone until after Mother's Day. I'm sure I'll tweak it here and there and add 'This and That'. 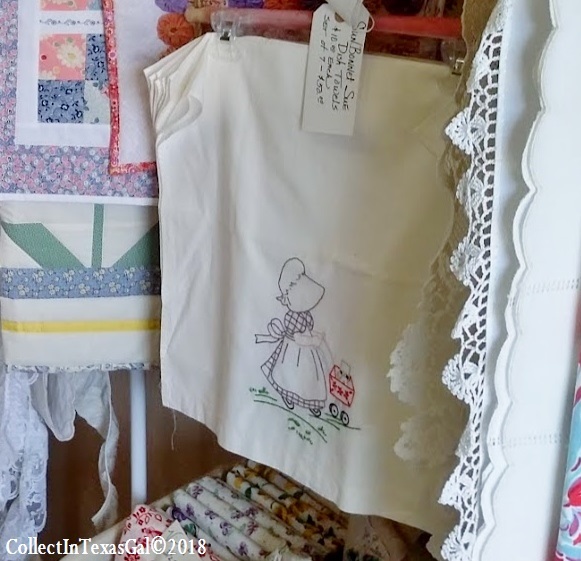 If 'This' Sunbonnet Sue Set of embroidery Tea Towels doesn't sell SOON...it will be one 'That' goes back home. I'm not sure I need to downsize my vintage stuff 'That' badly. 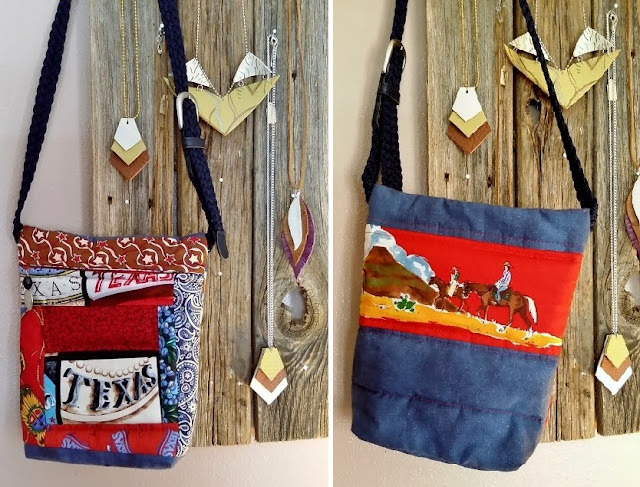 What do 'Shop Girls' do when the Rodeo comes to town? We go Boot Scootin' through our Texas stuff and HangEm' High. 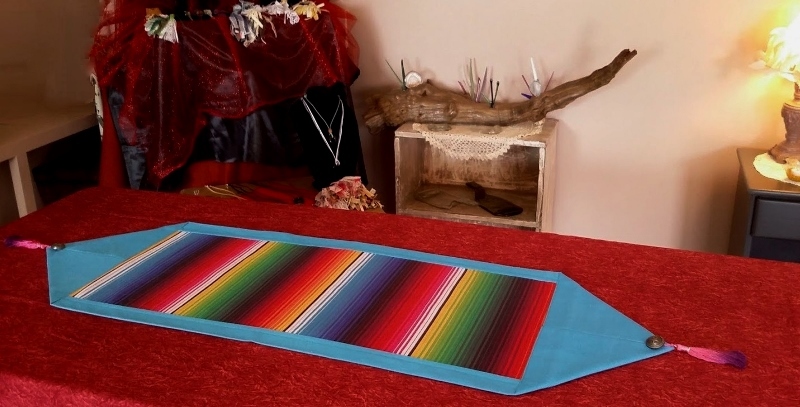 At least hang them where they catch ones eye, and in my current 'All Things Vintage' displays this Serape Table Runner meets that criteria. The Rodeo hit town over the past weekend with a parade, a carnival, stock show, arts and crafts exhibits and of course the Rodeo Arena Shows. It's a 'Big Deal' and 'Shop Girls' all over town are scootin' in their boots for a piece of the Rodeo pie. We are no different here at The Chicken Farm Art Center. We don't wrangle chickens, but we do wrangle for the attention of potential shoppers scootin' their boots down our 'Chicken Track' path. At the end of the 'Chicken Track' path they can step right in to Studios #13 and #14. 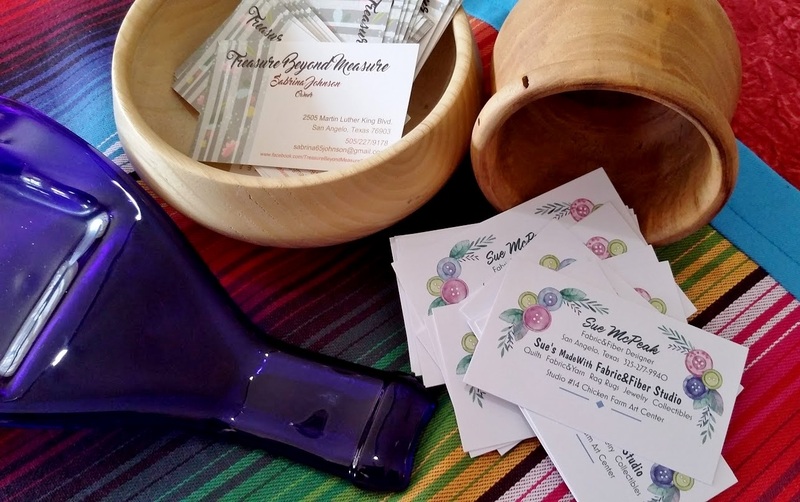 That'd be Sue's MadeWith Fabric&Fiber Studio and Treasure Beyond Measure. Being at the end of the Chicken Tracks and somewhat isolated from the rest of the Chicken Farm Studios, we 'Tag Team' to rein in shoppers off Rodeo Drive. 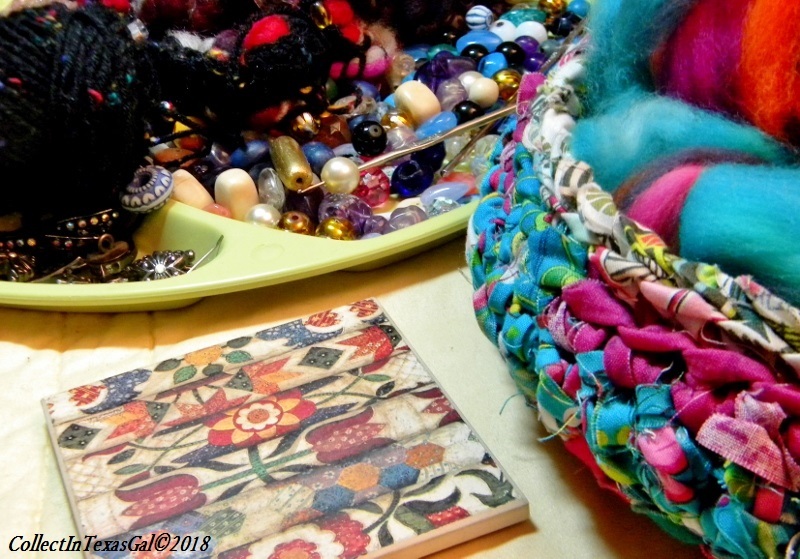 Sabrina's Studio 13 and Sue's Studio 14 at The Chicken Farm Art Center. 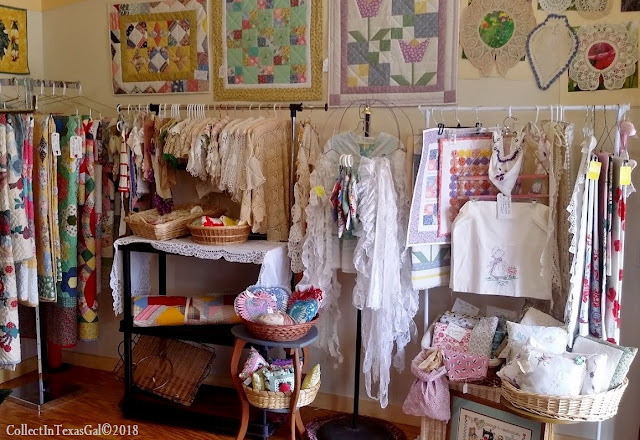 make these two Studio Artists Shops a unique browsing and shopping experience. 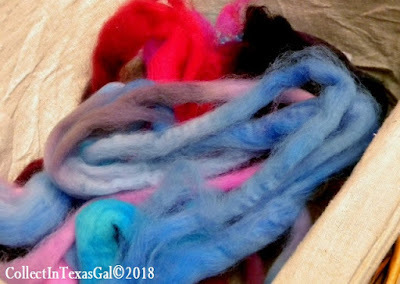 Adding a Spinning Wheel to my collection of Fabric and Fiber arsenal should not come as a surprise to anyone, myself included. However, it has and does...myself included. You see, in the past, a real, honest to goodness spinning wheel was wishful thinking and near the bottom of my Fiber Bucket List. 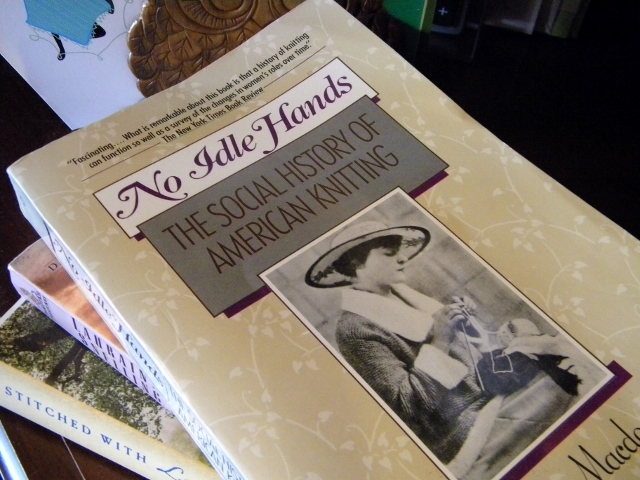 Plus, my interest in spinning yarn does not lie in knitting sweaters and for sure NOT socks. No, it's more in what is known as 'Art Yarn'....as seen on my Pinterest Art Yarn Board. 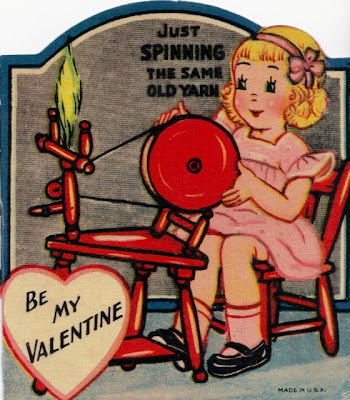 Perhaps my spinning intuition comes from my Colonial 5X Great Grandmother who no doubt HAD to spin for socks and unlike her 5X Great Granddaughter could make a matching pair, and did not suffer from SSS (second sock syndrome). Believe me as a knitter with a basket full of UFO socks and sweaters, 'Art Yarn' has a better chance of becoming at least A Christmas Stocking! "I can see her yet stepping back and forth beside the spinning wheel as she spun the rolls of wool into yarn." 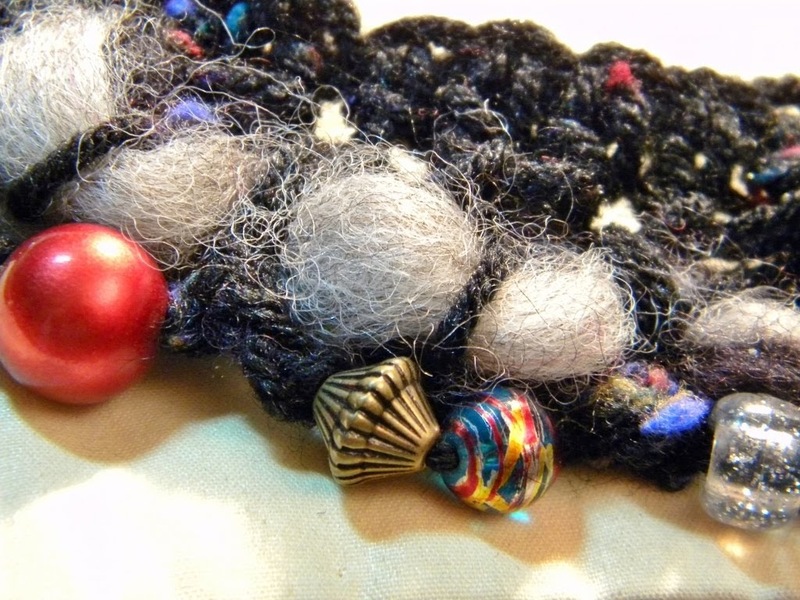 Skeins were often taken off the reel and one of us would hold them on our outstretched hands while the other wound it into a ball. Or we would place it over two chairs, turned back to back a little way around, and walking round and round, wind it into a ball. fear of having a mouthful of wool. 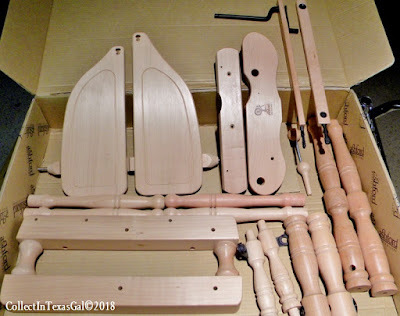 ....I had to seal all the unfinished wood pieces. 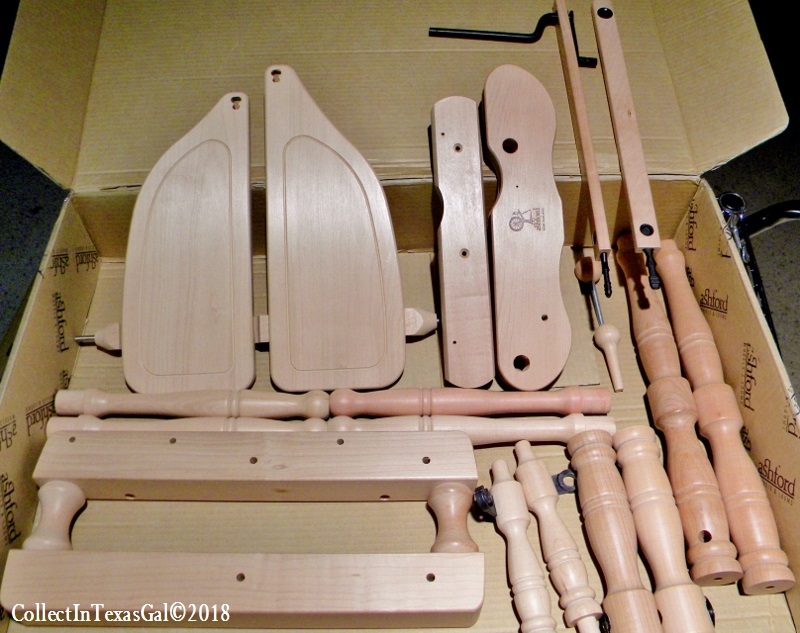 I must admit, it was a bit of a surprise to open the box and find so many pieces unassembled. Yikes, I hope I don't have any parts missing or worse yet have any left over. 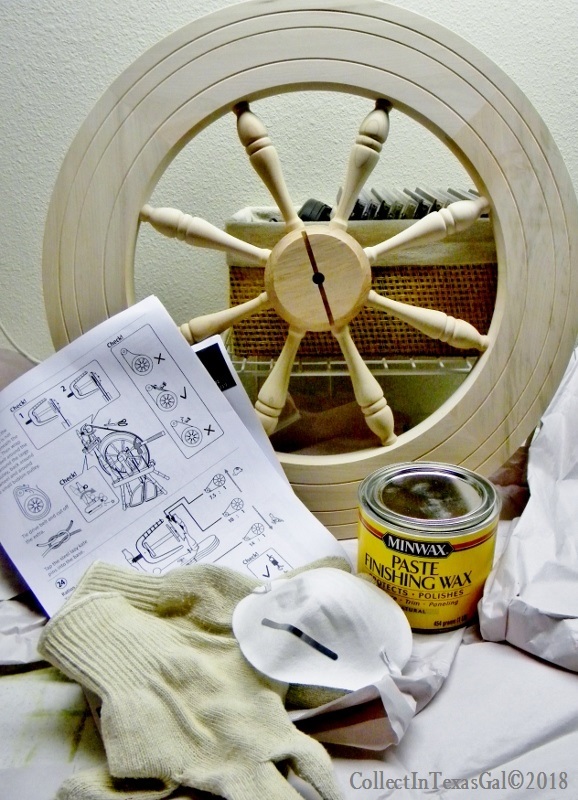 From the looks of that wheel, I'm debating if I should hoist the main sail or play wheel of fortune. I may have to set sail to New Zealand before all is said and done. Now that's a thought!! Already, I'm probably out of my element...they are talking RATIOS...#24. Thank goodness for the big 'X' for wrooong! I am sorta okay with some of the terminology since I learned in one of my two lessons what a 'lazy kate' is. 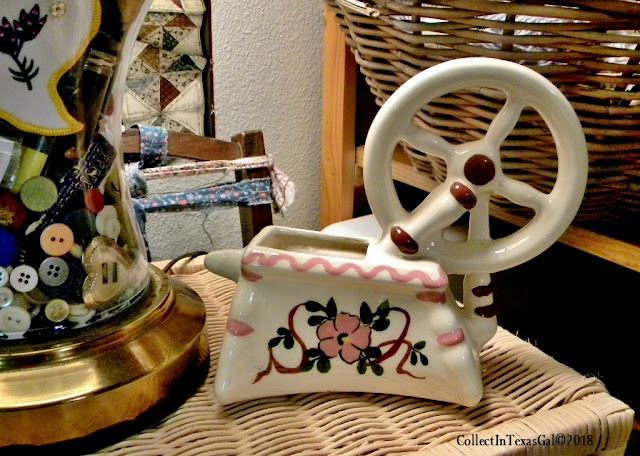 It's a thingy that holds spools. There are 4 of them, and I'm not sure what they are for yet, but I hope to find out in lesson three. You know what is really scary in this one of a zillion pages of assembly instructions? 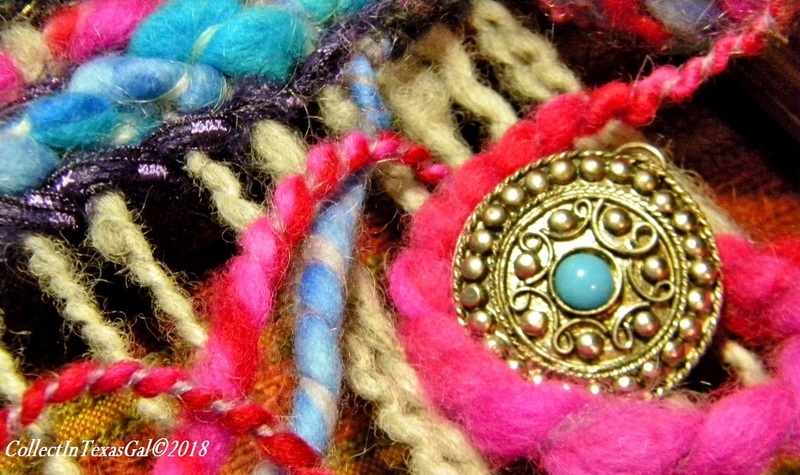 As a pincushion collector, finding a vintage crocheted Victorian pineapple pincushion at an antique shop had me hoping it would find it's way into my collection. It did not! It was too pricey and although it was faded, the ribbon edging was frayed and flat, I couldn't disagree with the price...the pincushion was loaded with Victorian Hat Pins. What was I thinking!!!! One of those pins would have justified overspending my set budget. Sometime later, I went back...it was gone! It is kind of ironic how I finally was able to add one or two or three to my collection. 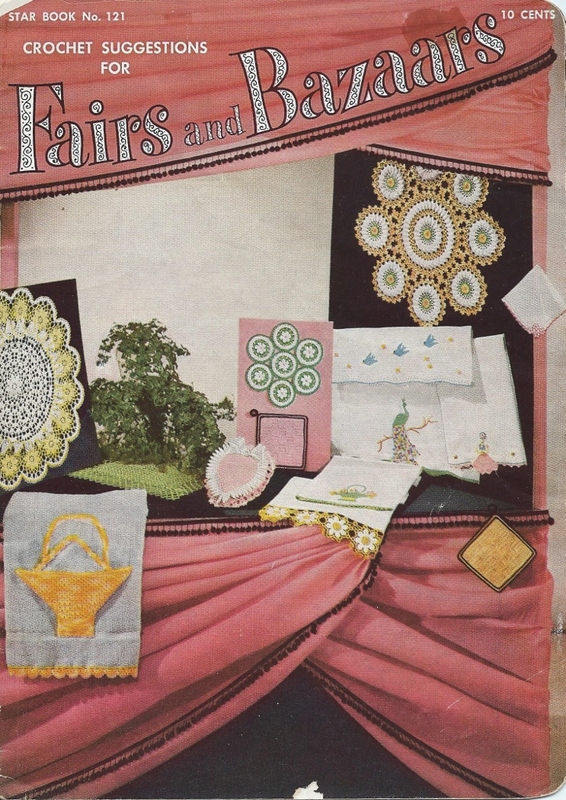 I purchased 'Fairs and Bazaars', an American Thread Company publication from 1955 for $3.00...$2.90 more than it's original cost of 10 cents. That was within my budget, and made the trip back to the antique store worthwhile. If you look closely...sitting on the center of the display table is a Pineapple Pincushion crocheted in pink with white ribbon edging. I could hardly believe my eyes, and quickly opened the fragile booklet to page 10. There it was, the pattern! Ooops! 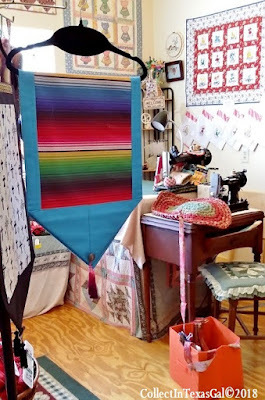 It called for that skinny thread and a tiny hook which was my one failure in Home Economics back in the day...like way back in the day. 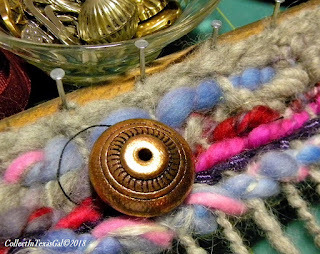 Oh well, that was then and I am more experienced with both tiny hooks and skinny thread now. Needless to say, I was hooked on that heart pincushion, and made several...okay more than several. Would you like the pattern? 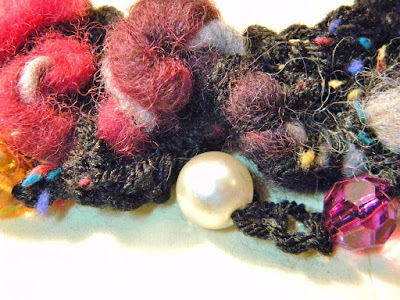 HERE it is...on Sue's MadeWith Fabric&Fiber Studio's blog.